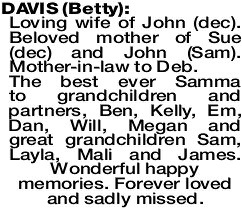 DAVIS BETTY Loving wife of John (dec). Beloved mother of Sue (dec) and John (Sam). Mother-in-law to Deb. 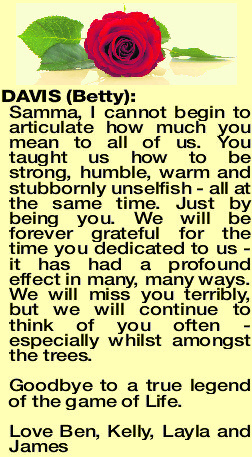 The best ever Samma to grandchildren and partners, Ben, Kelly, Em, Dan, Will, Megan and great grandchildren Sam, Layla, Mali and James. Wonderful happy memories. Forever loved and sadly missed. 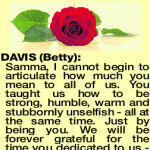 DAVIS BETTY Samma, I cannot begin to articulate how much you mean to all of us. You taught us how to be strong, humble, warm and stubbornly unselfish - all at the same time. Just by being you. We will be forever grateful for the time you dedicated to us - it has had a profound effect in many, many ways. We will miss you terribly, but we will continue to think of you often - especially whilst amongst the trees. Goodbye to a true legend of the game of Life.